Getting a forearm tattoo is one daring act especially if you are still in a conservative society, but lucky for others who are in a culture that have embraced this art and considered it normal. Today, we have collected 101 not just any tattoo, but impressive forearm tattoos for men. Why men? Forearm tattoos are liked and practiced by both men and women. You can have a portrait of a loved one, your role model, or a character from your favorite movie. Also, this type of forearm tattoo is done in either a black or a gray hue. 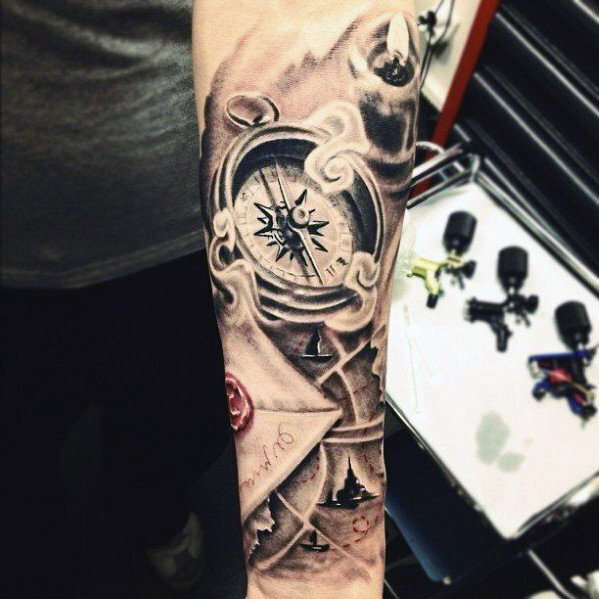 map tattoo – A different kind of forearm tattoo. It also has excellent capacity to become creative. With a forearm tattoo you’re in luck because all you need is a long sleeve shirt to hide it while you work to earn some cash. You won’t have to worry about immediately getting Xed during an interview at a company that considers tattoos unprofessional.